The area comprises three lochs: Black Loch, Creoch Loch and Loch o’ th’ Lowes – along with extensive water meadows on the floodplain of the upper River Nith to the east of New Cumnock and, to the west, mining subsidence lagoons fringed by reedbeds and a small area of heather moorland (Yellow Moss). 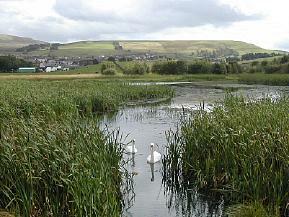 The former mining area, the Knockshinnoch Lagoons, is predominantly a Scottish Wildlife Trust reserve and can be easily accessed by walking up Castlehill lane past the cemetry, following the Community Pathway signs to Knockshinnoch from a large free car park on the opposite (east) side of the main street of New Cumnock at NS 617 138, or from a small SWT car park just to the south on the B741 at NS 614 132. New Cumnock is served by buses along the A76 and trains on the Kilmarnock-Carlisle line. The Lochside House Hotel (NS 602 148) whose drive leads off the busy A76 1.5km north-west of New Cumnock provides civilised viewing across Loch o’ th’ Lowes from its bar lounge, open to non-residents. Other parts of the wetlands can be accessed with care and consideration and an excellent overview of the eastern flood plain is had from the Craigdullyeart Hill byway. More information is available on the Scottish Wildlife Trust’s web site. Locked gate and stile from Castlehill Lane, further details to be posted here in due course. Short ride from rail station to the Lagoons. Quiet along Craigdullyeart byways. A76 requires great care. The railway embankment from the Boig road has been reinstated as a rail line and is therefore no longer an access option. The reserve can be viewed from the Boig road, from a nearby tree covered mound (NS 603131) or by walking into the fields adjacent to the rail line. Access to the restored bing and pools remains straight forward although parking in the area of the old church (NS617138) is being discouraged. The railway police and officials from the coal washing plant are threatening prosecution for anyone caught walking on the railway dividing the western half of the reserve from the restored bing. Even crossing the tracks is forbidden and cameras are apparently being used for back up evidence. There is no alternative if you wish to access the western pools but to drive around to the Boig road (1 km south west of New Cumnock at Connel Park) and park sensibly in the vicinity of Woodend Farm (NS598135). From here you can follow the old railway embankment to view the area. Apart from the wide variety of breeding waterfowl and waders, the location holds breeding Water Rail, Whinchat, Grasshopper Warbler, Sedge Warbler and Reed Bunting . Both Garganey and Spotted Crake have occurred in the spring, the former breeding on one occasion. A flight-line for migrants occurs along the Nith Valley and is regularly taken by birds heading to or from the Solway. Most obvious are flocks of Greylag, Pink-footed and Barnacle Geese , along with Whooper Swan , some of which winter on the water meadows at Polquhirter. Autumn is perhaps best for migrant waders such as Black-tailed Godwit, Ruff and Greenshank with the outside chance of something rarer. 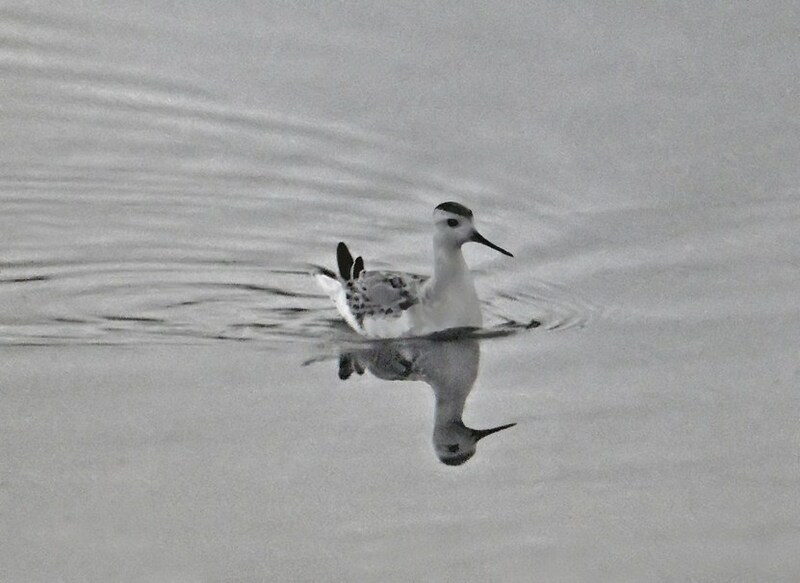 For example, Wilson's Phalarope has occurred. A number of paths through the countryside around New Cumnock have been sign posted. These cover diverse habitat, including the Lagoons, and could be worth exploring, especially during the passage seasons.